1.Fry potatoes in 2 tbsp oil. Set aside. 2. In the same pan, add 1 tbsp oil then stir-fry liver spread and beef until both sides of meat are brown. Add 2 cups water. Cover and simmer for 45 minutes or until tender. Retain only 1 cup broth (or add water to make 1 cup broth). 3. 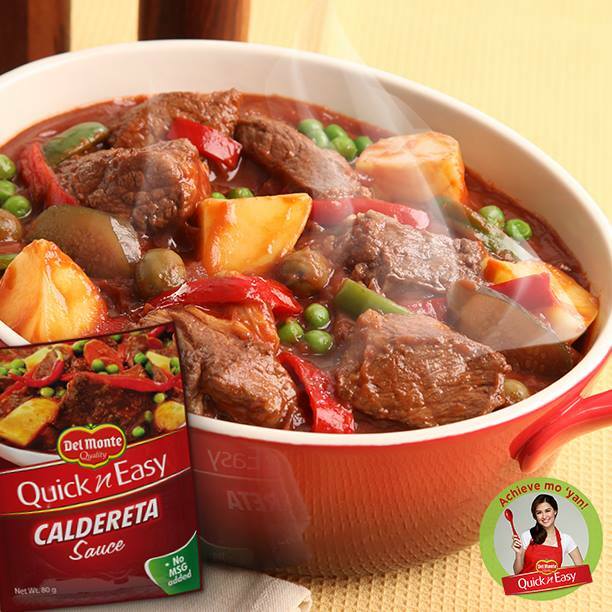 Add DEL MONTE Quick n Easy Caldereta Sauce, siling labuyo and cheese. Simmer for 5 minutes then add bell pepper and green peas. Simmer for another 3 minutes. Stir in fried potatoes.